Sautee strips of sweet pepper and any veggies you have on hand, such as broccoli or green beans, in a little oil over medium-high heat until crisp-tender. 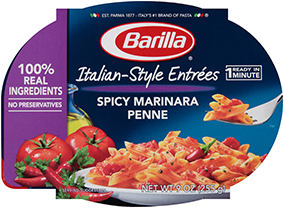 Add leftover Barilla Linguine or Spaghetti to the skillet and cook 1 to 2 minutes more to heat. Turn off the heat and lightly dress the pasta mixture with homemade or purchased Thai peanut sauce. Sprinkle with chopped peanuts and sliced green onions before serving. Spray mini muffin cups with cooking spray. Combine leftover mac and cheese with a little flour and a whisked egg. Spoon mixture into the prepared muffin cups and bake at 350°F for 10 to 15 minutes or until golden brown. Cool in muffin tins slightly before gently removing them to serve. Combine leftover Barilla Penne with olives, crumbled feta cheese, chopped cucumber, and halved cherry tomatoes. Drizzle lightly with Greek salad dressing and store in the refrigerator until ready to eat; serve cold. Spoon leftover Barilla Spaghetti with meat sauce into a greased 13 x 9 inch baking dish. Top with shredded mozzarella and sliced pepperoni. Bake at 350°F until cheese is melted and mixture is bubbly. Heat leftover pasta, such as Barilla Penne or Rotini in a skillet with sliced or cubed cooked chicken breast and a drizzle of olive oil. Remove from heat and toss pasta mixture with Barilla Traditional Basil Pesto. Sprinkle with Parmesan cheese before serving. In a large stockpot over medium high heat, cook chopped carrots, onion, and celery in a little butter until crisp-tender. Add chicken broth, dried thyme, cubed or shredded cooked chicken, and leftover pasta. Simmer 10 minutes or until veggies are tender. Serve with crackers, if desired. Don’t let the fancy name fool you; this pasta dish is incredibly easy to make! Melt some butter in a skillet over medium heat, cooking a few minutes until butter is golden brown. Remove from heat and toss the butter in leftover Barilla Spaghetti. Top with a generous amount of grated Parmesan cheese and fresh cracked black pepper. Mix together Barilla Rotini or Medium Shells with a little canned tuna and peas. Make a homemade dressing with a mixture of mayonnaise, olive oil, Dijon mustard, salt, and pepper.